Running out of content ideas for your social media accounts? Try out my 30 day social media plan to help give your channels a boost. Feel free to switch around the content and add your own flair to each post. These are just some general ideas to help you out. Introduce yourself! If your audience doesn't know the person behind the company (or the account) share a picture a brief paragraph about who you are. People connect with people, and it's a great way to build trust and relationships with your followers. Post a quote. Is there a quote that inspires you? Share it in graphic form with your audience and let them know why you love it. Share a helpful tip! If you work in a specific industry or have better than average knowledge about a certain topic, share a quick tip your audience might not know about! Go Live! Do a live video on Facebook or Instagram and show your audience what you're doing. Cross promote your platform! There will always be some content crossover on your social media channels, but you should always vary your content for each social media site. Use this chance to promote some of the other types of content you post on different channels. For example, if you do a specific type of photo challenge or trend on Instagram, share that on your Facebook and Twitter and let your followers know they can find it on your Instagram on a certain day (or however frequently you post that type of content). Ask a question. Polls are an easy fun way to engage your audience on social media. You can do simply a fun poll or even let your followers help you make a decision when it comes to product design or naming. Go behind the scenes! Do an guided office tour on video and share it! Offer a flash sale or discount! If you sell products, offer a flash sale or special discount just for your followers. Pick and choose which accounts you want to offer the sale/discount to, or promote it across all channels. Showcase your role model! Do you have a role model that motivates you to be a better business owner or person? Share a picture of your role model and why they mean so much to you. Showcase themed products! If you sell products, showcase different products within a theme. Since we're quickly approaching summer, maybe show off some of your brightly colored products. Maybe showcase products that will make your home smell good. They don't have to be by the same brand (if you sell products from multiple brands), but find a common connection and group them together). Make sure you have some eye catching photos to show off your products. Here's some tips from PetaPixel about photographing products. Go on a follow spree! Post a picture captioned follow spree and ask your followers to put links to their social accounts if they want to be followed. introduce an employee! If you have employees in your business, introduce them to your followers with a picture and a brief paragraph. Better yet, let the employee take over your social for a day and let the audience see the business from their perspective through a series of live videos throughout the day. If you're the sole person at your company, let your followers know a fun fact about you. Do a giveaway! Giveaways are an easy way to get quick engagement from your followers. Make sure you're giving away something of value that your customers will really want like a selection of products you normally wouldn't find together or a certificate for a service. Send followers to your website! Do a quick post to encourage followers to go to your website and check out fresh content. Say thank you. Don't forget to periodically take time to thank your followers for their support. Do a fill in the blank. Your posts don't just have to be promoting your business. Have some fun too! Write a fill in the blank style question and let your followers answer (just be careful when writing your questions and consider if some may be able to answer inappropriately). For example, we're located in Tennessee, so I might write "You know you're from Tennessee when __________." Share a testimonial! Let others know why your customers value you. Share a fan photo! Find a photo on social media of a fan with a products or using your service. Just remember to ask permission and properly credit them when re-posting. Recommend another business you work closely with! Do you have someone that prints all your signs? Or mows your business' lawn? Give them props on social media and share their contact information. Share an old photo! Share a photo from when you first opened your business or hit a big milestone. Share a news/blog article! Share an interesting article related to your industry. Caption! Ask your followers to caption a photo. Again, just be mindful of what you're posting and if someone can turn it into something inappropriate. Name a customer or follower of the month! Keep track of your most active followers and reward them for engaging with your brand. Offer them a free product or discount to encourage other users to be more active. Post a quote from an expert! Share a quote from someone who is an expert in your industry or who has been successful in running a business similar to yours. Sneak Peek! Show a teaser image of a new product or services coming soon or start a countdown to when it will be in your store. Share a blog post! If you have your own blog, share a post from it. It could be a more recent post or a link to your most popular article. Post a funny meme or picture! Find a funny (try to stay away from explicit language or content unless this is a part of your business appeal) relating to your industry and post it. Promote an event in your area! Are you sponsoring an event? Or maybe there's a public event happening near you that you'll be going to? Share it and tell your followers to come see you there! Host a Q&A! Answer fan questions during a certain time period. What are some of your ideas for fresh social content? Let me know down in the comments! Social media networks (Facebook, Twitter, etc.) have revolutionized the way that people communicate with each other and the way that businesses communicate with their customers. It’s a great tool to use to keep customers instantly updated with what’s going on within a company. For small businesses, it’s a great way to gain new customers. Most large companies have a person (or usually a department) that is in charge of maintaining social media accounts (uploading new content and interacting with customers). These companies have policies in place that restrict what employees can post using an official company profile. For small business owners it can be harder to know what is and isn’t proper social media behavior. Follow these general guidelines to avoid any mishaps while managing business social media guidelines. This may seem like common sense to most of you, but social media has also changed the way people type. To their friends and family, many people often don’t pay close attention to their grammar when sending messages over the phone or Facebook. However, bad grammar or spelling can hurt a small business. To some, it can seem very unprofessional and lazy. Mistakes can happen, but do your best to use proper grammar and spelling. There are many spell check options (and most browsers offer a spell checker). 2. Don’t curse or use vulgar language. Unless you’re a business that makes items with vulgar images or sayings, it’s best to steer clear. You never know who you might offend, and it could cost you a customer. 3. Don’t complain about personal things. The link above also is a prime example of another things you shouldn’t do: complain. Your customers don’t want to hear you complain about your day, the weather or how someone cut you off on the drive to work. Chances are people don’t want to hear about it on your personal Facebook either, but that’s a whole other matter. Stick to business matters. We’ve all seen “those” types of comments on business pages. The comments where someone complains about a product they received or the service they had while interacting with a company. We (as consumers) always want to feel like our feedback is being heard and that it matters to a company. With social media, it’s easier to be heard. While good feedback goes a long way, bad feedback spreads like wildfire on the internet. The last thing you want is to have someone bad-mouthing your company on your company’s Facebook page. It can be oh so tempting to delete that comment, but stop right there. This provides a golden opportunity for you to show the world (or more specifically, your followers) that you can take criticism and learn from it. When someone complains on your page, don’t just ignore it; respond to it. Make sure that customer knows that his or her complaint has been heard, and something is being done about it. Tell him or her that you appreciate their business and that you want to keep them as a customer. Have something to offer them -an incentive- to keep their business, but don’t try to bribe your way out of bad press though. Offer them a discount, AND ask them to come in to your place of business and discuss the ways they think you could make your business experience better for other customers. Get your customers involved, and make them feel important. Even if they don’t respond well to this, you can rest easy knowing that you did what you could to make their experience better. It’s far better to have them be unresponsive than for you to ignore what they’re saying. Customers make or break a business. Remember that. 5. Never, and I mean EVER, insult a customer. I don’t care if they are insulting your mother with a ‘yo momma’ joke you thought had been left behind in the 90s. Don’t EVER insult a customer over social media. Once it is online, it is there forever. It doesn’t matter if you delete what you wrote 30 minutes later; chances are somebody took a screen-shot of it, and it is now immortalized and filed away in the virtual “reputation ruining material” vault of some Redditor. It’s not worth the 10 seconds of satisfaction you got for returning that ‘yo momma’ joke in kind. 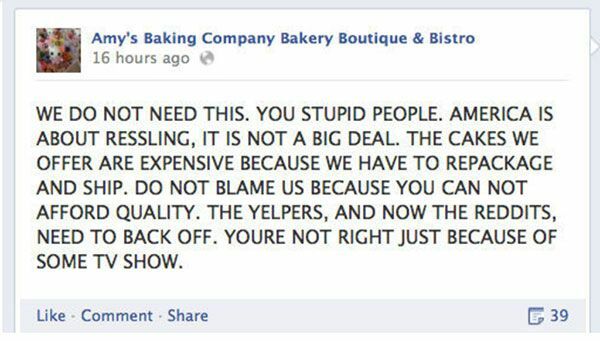 If you are ever unsure of how to respond to a customer, just take a look at how the folks at Amy’s Baking Company* handle their customers, and never do anything like it. Oh, and if you do decide to have some sort of psychotic meltdown and verbally bash your customers (a la Amy's Baking Company) and decide you need to clean up the mess, don’t claim that every single one of your social media accounts has been hacked. Be an adult, and just say you messed up. *For those who don’t know about Amy’s Baking Company, here’s a nice little article to get you up to speed. Twitter is a great place to start a social media conversation or see what the world is talking about by looking at popular hash tags. Businesses that want to promote themselves often invent new hash tags to get people talking about them. This can go horribly wrong though if not thought out carefully. Today’s disaster lesson comes from a big business, McDonald’s. McDonald’s started two hash tag trends: #meetthefarmers and #mcdstories. Well, the #mcdstories took off in a bad way. Customers started sharing their McDonald's horror stories, and it turned into a PR nightmare. It goes to show that, it’s always best to #thinkbeforeyoutweet. 7. Facebook/Twitter/Social Media in general is not your personal pulpit. It can be oh so tempting to use the audience you’ve gained through your business page to get your opinions heard, but before you dust off your old metaphorical soapbox, remember this: social media is not your personal pulpit. It’s not a place to talk about your political or religious views (obvious exceptions aside). You risk alienating customers by talking about such matters. It’s best to leave it to your personal Facebook page, or just don’t post it on the Internet at all. 8. Be aware of what’s going on the in the world. The NRA posted a pro-gun tweet the morning after the shooting in Aurora, Colorado. Speaking of Aurora, a boutique obviously didn’t get the message about the shooting when they tweeted that everyone must be excited about their new dress (called the Aurora). 9. Don’t use social media to promote something that capitalizes on a natural disaster, tragedy, etc. 10. Your business page is not your online dating profile. It’s always exciting when you get a new “like” or follower on your business’ social media page. Usually you can see who has liked your page or followed you, and you can see their profiles (depending on their privacy settings). It might be tempting for some to check out who this “Bob Handsome” or “Julie Hotpants” is that’s liking your page, but you can easily enter the creeper zone checking out your followers. It’s important to know where your followers are coming from and how they came about liking your page, but it’s more important to not use your business page to contact your followers for personal reasons, such as romantic interest, etc. It’s highly inappropriate, and you could get some bad press. It’s best to keep your romantic life out of your business page. That’s why it’s your business page and not your online dating profile. 11. Speaking of....Keep your relationship out of your business pages. Keeping on the same line as the first tip, it’s a good idea to keep your romantic life out of your business page completely. I know you’re excited about getting engaged or about the phone number you scored from that attractive person you bumped into on the street in one of those cheesy rom-com style “meet cutes,” but it’s best to not share that story with your fans. 12. Don’t make every post a sales pitch. Social media is a great place to spread the word about your products and services. You can highlight things using pictures, status updates, etc. It’s also a great place to connect with your customers. Customers don’t like advertisements clogging up their news feed. So while it’s a great way to spread the news about what you do/sell, don’t make everything you post about that. Use the opportunity to engage your customers. Post a status asking them how their day is going or ask them what they want to see in your store. 13. Don’t bogart another company’s #hashtag. Although anyone can #hashtag something on Twitter (and now Facebook), companies and brands have started creating unique hashtags to help promote their products and/or services. It can be a useful tool and a great way to get followers to interact with you on your social media accounts. However, if you’re looking to do the same thing for your company, don’t blatantly use another company’s hashtag campaign. This is called hashtag hijacking. Although it can prove difficult sometimes to come up with a completely unique hashtag because of the over-abundance of hashtags online, it’s disrespectful and tacky to just use another company’s campaign. Try to be respectful and come up with your own idea. For more about “hashtag hijacking” check out this article from smallbiztrends.com: http://smallbiztrends.com/2013/08/what-is-hashtag-hijacking-2.html. When you only have 144 characters to say something to your Twitter followers, it can be stressful trying to make sure everything you want to write fits in the allotted space. It may be tempting to abbreviate as much as you can, but think of it as a creative writing assignment trying to articulate everything in a few short sentences. It’s easier to abbreviate, and sometimes it’s unavoidable, but it’s more important to make sure that everyone can understand what you’re saying. Can you imagine a huge company tweeting, “Our new products r totes flying off the shelves”? Just…no. Be professional. You aren’t tweeting your BFF Jill. Although it’s good for companies to be able to have a certain sense of camaraderie with their customers, it’s important to keep up the professional attitude. Don’t- For a tweet about social media etiquette don’t use hashtags like #GameofThrones or something completely unrelated to your topic. It might get some people to view your tweet, but it does nothing to elevate the quality of your content. 18. Answer customer comments/questions in a timely manner. If you’re a business owner you’re probably not constantly glued to your computer like I am (or like anyone in the internet marketing business), so you may not be monitoring your social media pages around the clock. It’s important you can answer your customer questions asked via social media quickly. We are in the technology age where people want and expect things instantly. Unless you have a huge team of social media experts at your disposal, answering questions mere seconds after they’re asked isn’t realistic. The ideal amount of time to respond to messages and comments is under 5 minutes. If you’re a one-person operation, or just small team, you should try to shoot for under 30 minutes. You should definitely be checking your pages once an hour. I can’t stress answering messages promptly enough, because you can lose potential sales if you don’t. What are some of your best tips and practices for managing business pages on social media? Let us know in the comments!